Overlooking the River Teviot in Scotland, Monteviot House is the family home of the 13th Marquis of Lothian. It boasts contrasting Jacobean and Georgian styles, as well as extensive gardens. Monteviot stands on an ancient site and the church-owned lands were acquired by the Kerr family in the 16th-century. Traces of the old chapel and burial ground can still be seen today, hidden amongst the woodlands near the house. The Kerr’s are the descendants of the current owner, the 13th Marquis of Lothian. They are an old Borders family, with the first record of them dating from the 12th-century. The earliest record of the present Monteviot house is a lease from 1727 as a lodge, built by the 1st Marquis of Lothian. The 7th Marquis planned to transform this 18th-Century lodge into an elaborate Jacobean-style mansion. However, these plans were never realised and the only Jacobean feature to be built was an office wing. The 12th Marquis made the most recent adaptions in 1962-3 by replanning the interior and adding a new hall. These modern renovations were designed by one of the 9th Marquis’ grandsons, Schomberg Scott. It is this new design, along with the Jacobean east wing and the Georgian water tower, that greets you on arrival at Monteviot. This mix match of styles illustrates how this unusual family home naturally grew to fit the resident’s needs. 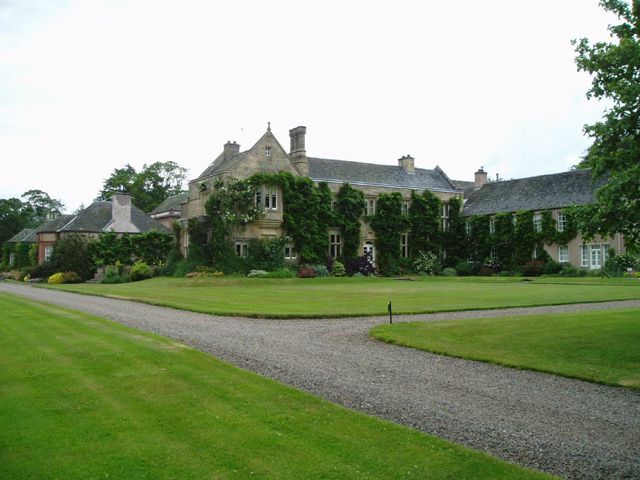 The gardens at Monteviot House are equally admirable and are claimed to rank amongst the most interesting gardens in the Scottish Borders, with 11 different gardens for you to explore. These vary from the traditional herb garden, with its geometrical box-edged beds, to the Compass Garden, which was recently added by the 13th Marquis to celebrate his eldest daughter’s wedding.